Summary: An hour of natural development and reveals that will spark the season onward in enthralling ways. Barry Allen manages to save Oliver from death injecting rat poison into his bloodstream to counteract a massive clotting problem. Oliver is none too happy that Felicity revealed his secret to Barry without his authority. Barry says he can help identify the super-strengthened attacker the Arrow fought. Oliver finds that Thea & Sin are harboring the injured Roy at the mansion, helps out with his wound, and suggests that the three leaving the Arrow well enough alone. Thea and Sin enlist Laurel to search into the blood drive sponsored by Sebastian Blood. She finds nothing wrong with the drive but that each person was given a psych evaluation to donate. Roy goes to the office of psych firm and gets captured by Cyrus Gold. Meanwhile, Oliver experiences hallucinations, talking with Shado and fighting with Slade Wilson, each trying to turn him away from being the hero. 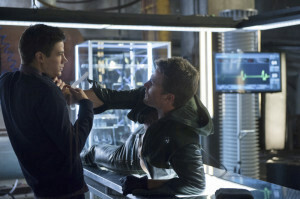 Barry is able to identify Oliver’s attacker as Gold and tests Oliver’s blood to see if the rat poison is giving him the hallucinations. After a confrontation between Gold and Diggle, the affected Arrow asks Officer Lance to go after Gold and kill him. Gold takes out all of Lance’s team, including his former parter, and sends Lance to the hospital. Barry reveals that Oliver’s blood is fine and that his hallucinations are psychological. 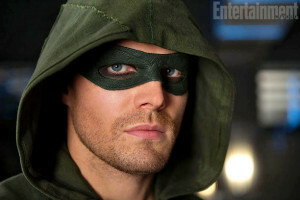 Oliver suits up and goes after Gold, discovering the lab, the captured Roy, and Blood in his mask. Struggling with Gold, Oliver talks to a vision of Tommy Merlyn who tells him to get over his guilt and be the hero they know he is. Oliver is able to defeat and kill Gold but Blood gets away. Roy has been injected with the Mirakuru super soldier serum and is near death but survives. Barry Allen returns to his lab in Central City. An accident with the particle accelerator at S.T.A.R. Labs sends mysterious energy into the stormy sky. As Barry attempts to close an open skylight, he is struck by lightning powered by the energy and thrown into the various chemicals of the lab. Blood makes his announcement of running for mayor of the city and meets with his benefactor, who is revealed to be Slade Wilson. On the island, Ivo pushes Oliver to make a choice between Sara or Shado being shot. When he won’t, Ivo moves to shoot Sara and Oliver steps in the way. Ivo turns the gun on Shado and kills her. In the Japanese sub, Slade comes back from death, now powered by the Mirakuru. Fearful for Shado, he runs after the group and attacks and kills Ivo’s men. He’s heartbroken when he finds Shado’s body, and Sara tells him they don’t know why Ivo shot her to protect Oliver from Slade’s wrath. That’s how the episode was billed. Setting aside the obvious reference to a certain nom de guerre of one Mr. Barry Allen, this hour lived up to that billing. In a single scene, the worlds of the past and the present collided, and the players at the board were revealed. To be fair and honest, it’s hard to say that the status quo was changed in any way because, truly, this is what the season had been built upon and building to the whole way. This was evolution not course change, and it’s a fantastic one. Much how last year’s midseason finale, the terrific “Year’s End,” kind of sneaked the holiday festivities upon us — though it was time-appropriate for the audience, it seemed a bit off that it was already Christmastime on the show in that way that television shows do — we suddenly find ourselves amidst yuletide celebration. In a shrewd and subtle bit, even Oliver is surprised to find its already time to start trimming the tree. And as the Christmas-to-New-Year’s stretch is distinctly much about the past and reflection as it is celebrating the present and those around us, it felt only fitting that Oliver would be haunted by his. Clearly taking a page from Dickens’ well-worn classic A Christmas Carol, the title of the episode refers to the visitation of the three Ghosts of Christmas that set Scrooge on his path to redemption and in Oliver’s case help him to finally assume his mantle as hero. There’s an intriguing yet head-scratching choice to make the vessel of Oliver’s visitations, hallucination, a bonafide psychological phenomena rather than the more believable side effect of the rat poison Barry used to thin Oliver’s clotting blood. While people can no doubt be haunted by events and people of their past, something Diggle solemnly speaks to about his own experiences from war, the vivid realization of Oliver’s hallucinations speaks to significant brain drama that would be overwhelmingly disturbing on other shows. Yet it, among a few other key points, helps to mark a distinct transition of the series going forward. If there was any doubt about the series moving from a ground crime drama to a dark fantasy rooted in foundational realism, “Three Ghosts” erases that, and Oliver’s interactions with his deceased cohorts puts a clear stamp on it. Sure, it’s technically a visual device to convey story to the audience, but tonally and thematically, it shifts the needle into the surreal and comic book realm. Shado is the first of the “spirits” to visit Oliver, and it’s a fascinating choice because it seems to immediately answer the question of her fate on the island. It also lulls us into a bit of a false pretense about the nature of the apparitions, painting us a picture to believe that they are all truly dead. A nice bit of misdirection for the reveal at the end of the episode, though in Ollie’s mind each is dead. While it’s quite clear that there is guilt attached to the vision of his former love, Shado also represents a softer, more selfish side. The preservation of the one. She pleads for him to give up his quest so that he might save and protect himself. It’s genuine and not meant to be a distraction, but it speaks to a very fundamental aspect of the hero, letting go of their personal wants, needs, desires, drives, selves to devote themselves to something bigger and greater outside of them. As soft as these moments between Stephen Amell and Celina Jade are, it’s quite interesting that he works his way through her presence rather quickly. He’s already made his choice, made his sacrifice, and won’t be swayed from it. Still, despite her appearance as a “ghost,” the moment where Ivo shot her was still rather shocking. It wasn’t hard to believe that she might not have made it off of the island, but it also feels like we haven’t spent enough time with her yet. In that sense, one can’t help but feel cheated by her death, though it’s clear to see that it will reverberate as much in the past timeline as Tommy’s has in the present. It falls perfectly in line with the M.O. of the series to not take their foot off of the gas of plot. Slade’s believed killed by the Mirakuru serum, Shado is sacrificed, Slade is resurrected only to find his heart’s desire gunned down, setting off the inevitable confrontation between Slade and Oliver. This is only nine episodes in. This reviewer, for one, would’ve loved to have seen more of the interpersonal dynamics between Team Lian Yu. Perhaps we can have the five months of time between the defeat of Fyers and the arrival of the Amazo crew relayed to us in the companion comics, seeing as those have yet to make a reappearance this season. 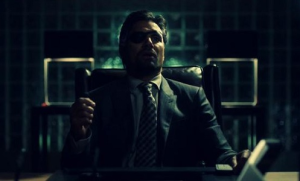 Though, it’s sad we won’t get to see everything play out in the hands of Manu Bennett, Jade, and Amell. Speaking of Bennett, he’s been a trooper this season so far. To be quite honest, there hadn’t been too much to this point in the season to really justify him being a series regular. He’s turned in stellar work with the little he’s been given but there really had been far too little of him. That changes in a big way this go-round and it finally answers one of the bigger questions of the series that’s been around not only since he first appeared but since the reveal of the impaled Deathstroke mask way back in the pilot: when will Slade Wilson appear in the present? As mentioned above, his reveal as the man behind the curtain wasn’t a gamechanger. It was an inevitability. Yet, that takes nothing away from the sheer pleasure of seeing him arrive on the scene. That he ties directly into Sebastian Blood’s scheme is a tasty bit of plotting, and it opens a whole range of possibilities moving forward on the season. With the threat of the League of Assassins still lingering in the background and the soon-(and sure-)to-be expanding presence of super-abilities, expectations for fireworks as the season wears on are high. What makes this really appealing — it actually mirrors last year’s reveal of Malcolm Merlyn as the Dark Archer in that season’s midseason finale — is that it is such a personal connection to our hero. What makes this a better development than Malcolm’s is that our Big Bad has it on the Arrow, knowing exactly who he is and how to get to him. One of the ever-living tropes of superherodom is the fact that the bad guy doesn’t know his opponent’s secret life, a chance to get to the raw meat and really hurt his adversary. Not only is Slade Wilson superpowered, but he trained Oliver, befriended him, and they have a tragic history that sets up a very personal conflict. There isn’t an outside concern for Slade here; everything is about tearing Oliver down. That kind of pure focus makes for a very compelling storyline. For the viewers, most importantly, it gives Bennett more to do and a more vital presence in both timelines. That’s a huge treat, and any fan of the show has to be salivating at the potential Arrow-Deathstroke showdown. It also doesn’t hurt that we get to see Slade in a vastly different look from his island appearances. (Can someone explain to me why Oliver’s hair continues to grow on the island as it naturally should but Slade’s never seems to move an inch? Are we to believe he’s that good with a knife and cares much about grooming in this situation?) Looking dapper, dashing, and quite roguish in his suit and eyepatch, he has the air of an international spy, which works perfectly for the top mercenary in the DCU. The flecks of grey in his hair give him a wonderfully commanding and seasoned look that plays well off of the mentor/mentee relationship and makes him almost a Bond-type villain for the “Kid.” It’s a terrific choice. 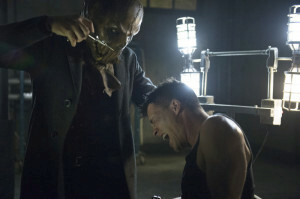 Wilson’s appearance as the second ghost is supposed to represent the fear and doubt of Oliver on his path to being a hero. In a way, it’s similar to his reaction to the beatdown he received from his first confrontation with the Dark Archer, recalling his failings and foibles in his quest. Though he gets whooped, Oliver survives and pushes through. That sets up the third visitation very well, really capturing where he is along his journey toward becoming a hero. Tommy was the most obvious third ghost — Oliver having to let go his guilt over his best friend’s death to move forward — yet I have to admit that I was more than a little surprised to see Colin Donnell back on the show for the episode. It easily made for my favorite scene of the hour, not only for the de rigueur hero-building moment but for representing and solidifying the connection between the two characters and actors formed last year. It was a smart choice but it was also the only choice, much like Slade being behind the machinations in the city this year. Oliver letting go his self-imposed guilt and finally earning a domino mask is a strong milestone on his path. Slade revealed as one of the two Big Bads on the season. These are big developments, though not course-shifting. What could be considered the gamechanger this time out falls to Roy Harper. As Green Arrow was selected as the hero to focus a series on because of his lack of superhuman abilities and past story arcs in the comics that lent themselves to more of a crime action drama, it’s a very interesting decision to give the sidekick the super-advantages. 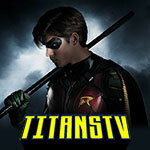 It allows them to explore these changes on the positive side of the spectrum while having present consequences that differ much from Slade’s coming experience in the past timeline. As Roy was already a hothead with limited impulse control in his pursuits, it’ll be a curious evolution for him coming to grips with the power and responsibility he’s been granted. It’s quite clear that this will be the substitute for the well-known heroin addiction storyline of his comic counterpart. This is also an alluring catalyst to cultivate the Oliver-Roy relationship. With Roy becoming an informant for the vigilante, it presented the opportunity for the two to interact and for Oliver to help guide his young charge in his path. Yet, with Oliver pulled off on his own and Roy out ‘Mystery Inc.’-ing around with Thea and Sin, we haven’t had the benefit of that interaction on the season yet. This culminated in a rather gruesome exchange last episode where the Arrow had to hobble the youngster both for Roy’s protection and to keep him out of his way. (There was something particularly gratifying in Oliver seeing the repercussions of his actions after the fact.) 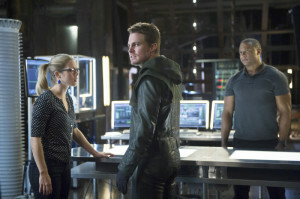 Now that Roy has been injected and managed to survive, Oliver charges Team Arrow with keeping an eye on the young man. This will clearly lead to more active participation in his maturity by the elder Oliver, something that will not only give them that exploration of the effect of these new abilities on this world but should help to ground Oliver’s advancement as a hero as well. “When the student is ready, the teacher will appear.” With Oliver as teacher, it feels as though it might give him the chance to soar even greater as he steers Roy through the pitfalls. Perhaps, soar even to a certain colorful adjective added to his heroic moniker. Could this mean a further, more permanent addition to Team Arrow? If memory serves, it’s been hinted at or stated that at least one other person will learn of Oliver’s secret this season, following Black Sara-nary’s inelegant affiliation and Barry Allen’s trial-by-fire introduction to the man behind the greasepaint and hood. 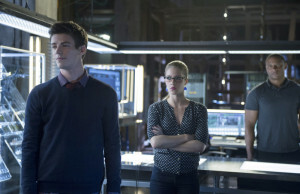 Roy would seem the most likely candidate, and it adds well to the dynamic of the team supporting Oliver’s growth: Diggle is the moral compass and a tactician; Felicity is the compassion, the heart, and the technician; and Roy could serve as the grinding stone for Oliver’s heroic rough edges through the mentorship, in addition to being a good foot soldier. If anything Barry’s guest stint showed, having some additional manpower on the team certainly makes them more effective and more fun. Barry was certainly fun. It was a very different take on the character, with the age certainly playing a factor and borrowing some liberal dashes of Barry’s sidekick and successor Wally West without co-opting his personality wholesale. People have become so used to the Wally West version of the Flash, a man as fast and glib with his mouth as he is his feet, that it’s hard to adapt the hero in any one of his alter egos without being colored by that. 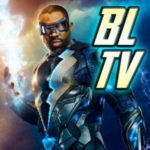 Barry always came off a bit more scholarly and straight-laced, but they managed to find some great layers and angles with this new TV version to make for an affable character you wouldn’t mind following week to week. Much credit should be given to Grant Gustin for inhabiting such a great character, yet never once feeling like he stole spotlights away from the show. There has been a lot of recent comparison between Arrow and the MCU-based series Marvel’s Agents of S.H.I.E.L.D. in the media and amongst the fandom online. Many lean toward the former being the superior of the two shows, even granting the one-year head start. A common refrain seen, though, is that Arrow was “awful” in the first part of its inaugural season, too, and that people should give S.H.I.E.L.D. a chance. While I would disagree with that assessment for reasons you just have to read back through our reviews to see, there was an adjustment period during those first nine episodes as the show was trying to find its footing and identity. It wasn’t until the midseason finale last year that it really established itself and had a foundation upon which to jump off of in the much better second half of the season. This year, the show hit the ground running, and while there are a few things that haven’t quite hit during these first nine episodes, the strength and command of the series really shined through. That made this episode a bit of a victory lap. Yet, instead of celebrating, they’ve ratcheted everything up, and most pleasingly through natural and earned developments. It’s hard to say if “Three Ghosts” is the best episode of this early run of the season in the way it was clearly easy to identify “Year’s End” as the best of last year’s early run. Yet, it was an episode that strengthened all of the existing storylines and added some personal connections to the big arcs to keep the stakes high going into the second half. And we finally got the mask. Wins all around. Sorry Olicity fans, but one couldn’t help but feel disappointed when Felicity was given a moment of such raw and disgustingly dripping jealousy in her reaction to hearing about Shado being on the island with Oliver. It was an ugly and unnecessary moment for a great character. If the Mirakuru could heal Slade’s burns, why couldn’t it repair his eye? Though they were pushing the connection Cyrus Gold and the Solomon Grundy nursery rhyme hard, it was a bit unexpected that they pushed Gold down the path towards his ultimate fate on the series. Him being Mirakuru’d was obviously the first step, but disfiguring him with chemicals and killing him off was a bit of a surprise. There were terrific performances throughout the hour, but particular note should be given to Paul Blackthorne. Learning about his former partner Lucas Hilton’s death was wrenching and Blackthorne was superb. They’d been trumping up the S.T.A.R. Labs particle accelerator as the likely culprit behind Barry’s transformation all season, but how it played out was far different from what could’ve been guessed at. That it was rooted so closely in the origin from the comics was a Christmas card to the fans and a prime example of the ways in which the showrunners use the comic source material so wonderfully in this show. Speaking of Barry, there was a nice reference to his relationship with Iris West that helps set up the Flash series well.